When creating a new character, you will be prompted to select your homeland from one of the provinces of Tamriel. You are in effect selecting your character's race, as each of the eight major races hail from a specific province. 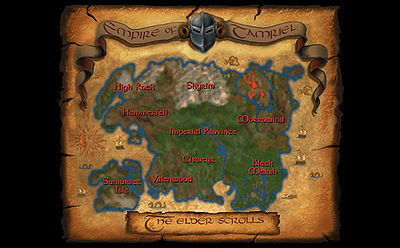 There is an additional province, Cyrodiil, but it is not an available option: it is the Imperial seat and, according to Daggerfall lore, it does not boast any one specific indigenous race because of its geographically central position (the Imperial race was only introduced in later Elder Scrolls games). Orcs are also not available, being considered an enemies-only race at this point. The racial modifiers to attributes do not actually function. The starting values of your attributes are defined by your class, which overwrites any modifications made by your race. Because of this, race is purely cosmetic unless you choose a High Elf or Nord, whose immunity to paralysis and frost resistance still apply. For additional information, see The Races of Tamriel. Argonians hail from the province of Black Marsh. You are part of a highly-evolved race of reptiles, known for their intelligence, agility, and speed. Because of their reptilian nature, Argonians do not tire easily when swimming. While many Argonians have successfully mastered the arts of thievery and spellcasting, there are some regarded well as warriors. Bretons hail from the province of High Rock. You are part of a tall, fair-skinned people, highly intelligent and willful. Magic seems to infuse the very being of the Breton people. As a race, they are more resistant to the effects of hostile magic than any other group, and thus are excellent in all arcane arts. Dark Elves hail from the province of Morrowind. You are part of a tall, dark-skinned people, known to be extremely strong, intelligent, and quick. They are extremely versatile in all manners of skills and well-known as warriors and mages. High Elves hail from the province of Sumurset Isle (note that spelling of this province's name has changed in more recent games). You are part of a tall, golden-skinned people, extremely intelligent, agile, and willful. The magical nature of Sumurset Isle has made the High Elves natural spellcasters who are immune to paralysing poisons and spells. Khajiit hail from the province of Elsweyr. You are part of a tawny-skinned people, extremely hardy, intelligent, and agile. Many Khajiit have taken to painting their faces to more resemble their legendary feline cousins, the predatory cats that hunt the great desert. Khajiit are on the whole excellent climbers, and adept in all the arts of the thief. Nords hail from the province of Skyrim. You are part of a tall and fair-skinned people, strong, willful, and hardy. Owing to the climate of Skyrim, Nords are resistant to the coldest of temperatures, and take little damage even from ice-based magical attacks. Nords are historically well-suited to all the arts of the warrior. Redguards hail from the province of Hammerfell. You are part of a dark-skinned people, extremely hardy and quick. Legend has it that the Redguard are innately more proficient with weaponry than any other race. In general, Redguards make excellent warriors. Wood Elves hail from the province of Valenwood. You are part of a small, fair-skinned people known to be extremely agile and quick. Wood Elves have a natural affinity for the bow and arrow, and all members of their race have some ability with that weapon. There are well-known Wood Elves in most every class, but the arts of thievery are their particular forte. The benefits (and curses) of Vampirism are so numerous they must be described in the Vampirism article. The benefits (and curses) of Lycanthropy are so numerous they must be described in the Lycanthropy article. Esta página foi modificada pela última vez à(s) 15h00min de 6 de outubro de 2017.